Another mass shooting. Seventeen families inducted into an exclusive club no one ever wants to join. Eighteen school shootings in the first 45 days of 2018. Along with the hollow political chorus of “thoughts and prayers” by folks enriched by NRA cash, we are told to “see something, say something.” Well, here goes. I’ve worked as a full-time volunteer public-education activist for 10 years. I’ve advocated, written, researched and lived through my own children the systematic, politically driven effort to dismantle public education in Florida. I see a glorious public asset, our schools, torn apart brick by brick every year by politicians taking orders from the likes of Jeb Bush and the Koch brothers. I see our public-school funding hollowed out as legislators write bills brokered by vendors in exchange for campaign cash. I see disbelief and sorrow in the impossible fight to overcome a 3:1 GOP to Democrat ratio, where the odds are never in our kids’ favor. I see political leadership maligning teachers as “evil,” making educators their whipping boy, refusing professional pay, stripping classroom autonomy, threatening to dismantle their union, marginalizing teaching certificates. Despite all of this, I see the sheer, undeniable power of brave teachers standing between evil and our children each and every time. What other non-law-enforcement profession would face death for our kids? Football Coach Aaron Feis ran as fast as he could into harm’s way, using his body to shield his students. This American hero laid down his life for our children Wednesday. “I managed to get 19 kids in the closet with me. Society failed these kids today,” Melissa Falkowski, a journalism teacher at Marjory Stoneman Douglas High School, told CNN just hours after the shooting. She and all the other teacher heroes kept terrified teenagers quiet, knowing that each of them was someone’s precious baby. I see politicians standing in extreme denial of the obvious. They have grossly defunded school counselors, social workers, behavior specialists and psychologists, the very professionals best suited to identify and help troubled kids. It says a lot about priorities when funding pays for only one psychologist for six schools filled with thousands of students. I see recalcitrance on the part of politicians who will not even utter the words “sensible gun control” for fear of losing millions in NRA political-action-committee dollars. Ironically, earning an A+ from the NRA is more important than putting all options on the table to find a way to save lives. I see folks on social media parroting cable news talking points instead of examining the cold, hard truth. Each of us had better take a long look in the mirror. Why are we willing to accept the world politicians choose for us? 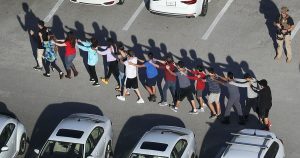 The Second Amendment, sensible gun control and mental-health professionals for schools can all stand firmly on common ground. What we lack are courageous lawmakers ready to lay down their political lives to make this a priority. I’ve seen teacher after teacher step up in the face of gun violence to protect everything we hold dear and sacred in lives — our children. What does it say about us as a nation, as a state, if we as parents, voters and lawmakers will not find the bravery to do the same? It’s way past time to take “see something, say something” one step forward. It’s time to replace those politicians who will not be part of the solution. This is the very least that we owe to all of the American heroes like Coach Aaron Feis and Melissa Falkowski, whose bravery puts the rest of us to shame. Authors note: It is with great sadness and pain that there is yet another occasion to write about a tragic, preventable mass killing of children and their teachers. The first time I wrote about such a horrible event was for Sandy Hook. Back then, it was everyone’s desperate hope that our nation would for once ignore the NRA and act to protect our children by banning assault rifles and large magazines, investing in mental health care and screening and closing all loopholes for both the gun registry and sites of purchase, including private and gun show sales. This is the piece I wrote about Sandy Hook and Teacher Bravery on December 17, 2012 and it was printed in papers across the country. As the brilliant student survivors of MSDHS say: #NeverAgain. If “arming teachers” can’t be insured, is the debate just a cruel charade?